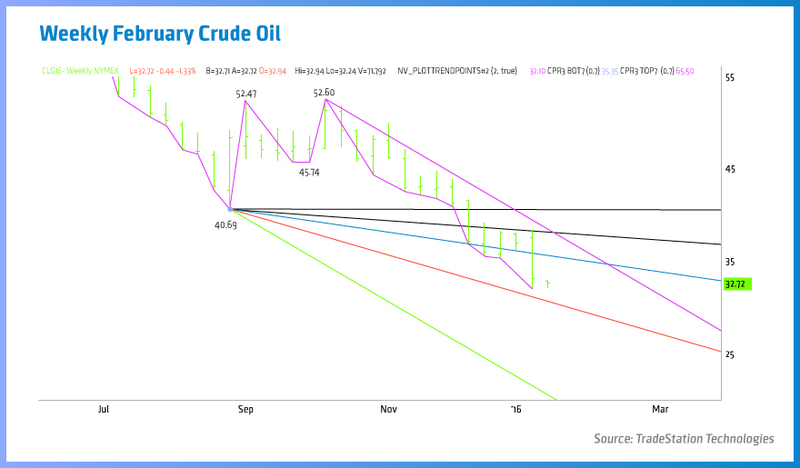 Despite the overwhelmingly bearish fundamentals, the prolonged move down in terms of price and time has put February Crude Oil futures in a position to reach a short-term support level and perhaps form a potentially bullish closing price reversal bottom. Based on the January 8 bottom at $32.16, the first major downside target this week is a downtrending angle from the $40.69 main bottom. This angle comes in at $30.69 this week. We’re not trying to pick a bottom per se so we’re not suggesting to buy the market at $30.69. At a minimum, we’d like to see this angle tested. However, we want to see a test of this angle followed by a reversal back through last week’s close at $32.16. We want to buy the reversal through last week’s close in anticipation of the formation of a weekly closing price reversal bottom. If this occurs then we could be looking at the start of a 2 to 3 week short-covering rally. Trying to pick a bottom in a falling market is dangerous because there is no logical level to place a stop-loss order. Successful traders know their exit before they initiate a trade. This is why we’d like to see the market stop at or near $30.69 first then reverse back over the previous week’s close. This type of price action will indicate a shift in momentum, but more importantly, we’ll have a logical spot to place a stop-loss order. The previous trade recommendation was for more conservative traders. For more aggressive traders, the clock starts ticking when last week’s low at $32.10 is taken out. By definition, the best closing price reversal bottom chart pattern begins with a prolonged move down in terms of price and time. This is followed by a lower-low than the previous week, and a close above the week’s opening, the week’s mid-point and higher for the week. In summary, aggressive traders should watch for a break through last week’s low at $32.10 then look to go long if the market overtakes the previous week’s close at $30.16. More conservative traders should wait for a test of a downtrending angle at $30.69 then look to buy a reversal rally through the previous week’s close at $30.16. In both cases, we’re looking for a lower-low than the previous week, and a move back above the previous week’s close. Depending on your risk tolerance, you may even want to wait for an actual closing price reversal bottom to form on the weekly chart then buy next week if it’s confirmed rather than trying to anticipate the formation of this chart pattern. This week’s trade idea is technically based, however, bullish fundamental news will certainly help in the formation of the reversal bottom we are looking for.